Saoirse Ronan first worked with Wright on “Atonement,” playing a 13-year-old girl responsible for her sister’s lover being sent off to war. In “Hanna” it is Ronan who goes to war, diving head first into the battle. 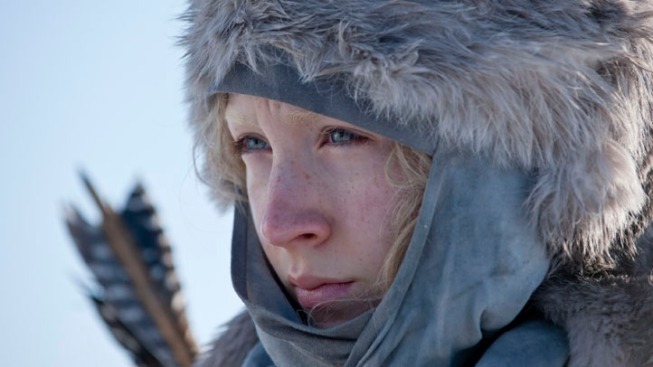 Trained her whole life to survive in the wild, Hanna is a well-tuned assassin. But as she nears adolescence, she begins to chafe at the solitude of life with just her father (Eric Bana) in the wilds of Finland, and so literally “flips the switch” that will beckon the mysterious Marissa Wiegler (Cate Blanchett), whom Hanna is eager to meet. What follows is a race across Scandinavia, Northern Africa and central Europe. Ronan keeps a tight hold on Hanna, shifting from wide-eyed wonder to bloodlust without a hitch. Unfortunately, the script, by David Farr and Seth Lochhead, lacks Ronan’s discipline. One minute she’s overwhelmed by a room full of fluorescent lights, ceiling fans and remote controls, the next she’s Googling with such lightning speed that she’s able to get the secrets to her past all but unraveled. Either moment could work, but the two together are incongruous. Blanchett’s Wiegler is a hopelessly repressed monster so committed to her mission that she’s blind to her own humanity. With her saccharine-y Southern twang and her perfectly coiffed red hair, she’s like the Big Bad Wolf in grandma’s nightie. Tom Hollander is skin-crawlingly creepy as a bleached-blonde pansexual sadist whom Marissa brings on board to hunt down Hanna. Between his tennis short-shorts and incessant whistling, one shudders to think what he’d do if he got his hands on your kid. Throughout the action, the pulsating soundtrack from The Chemical Brothers dovetails with the pop-pop-pop of gunfire, the wail of sirens and thunderous beat of helicopters to great effect, and is often appropriately disorienting. For a man who’s made his bones crafting English melodramas, Wright’s direction here is remarkably assured--it’s at its best, its most natural, when he tries the least. The fights are clean and quick, the footraces down side streets and between shipping containers are crisp and exciting. It’s when he does things like sends a merry-go-round spinning just for the sake of watching it spin that he loses control. An action movie with brains and a heart, “Hanna” is a righteous good time punctuated by great music, some awesome locations, great acting and quite a bit of humor.